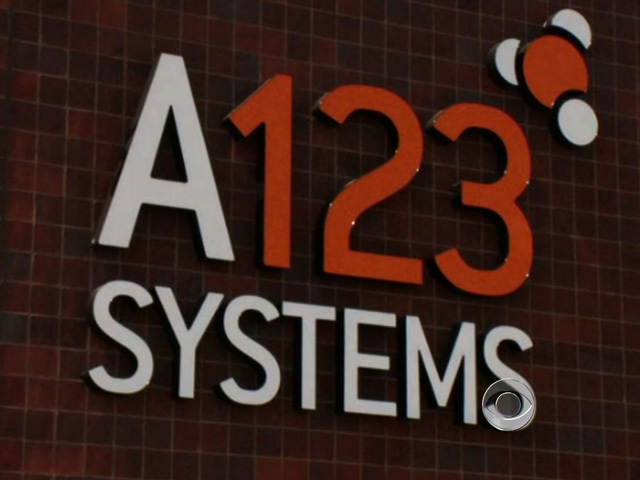 A123 Systems Inc. announced today, ahead of the second presidential debate, that it's the latest recipient of stimulus funds to file for bankruptcy, giving Mitt Romney more fodder to slam the president's clean energy investments. "At the town hall debate four years ago, then-Senator Obama promised to 'easily' create five million green jobs," Romney campaign spokesperson Andrea Saul said in a statement today. "A123's bankruptcy is yet another failure for the president's disastrous strategy of gambling away billions of taxpayer dollars on a strategy of government-led growth that simply does not work." After the Obama administration committed $90 billion in stimulus funding for clean energy, the electric car battery maker A123 received a $249.1 million federal grant. The company used its stimulus funding to open two plants in Michigan, spurring President Obama in 2010 to call A123 and congratulate it on its "tremendous milestone." The new funding enabled the company to hire 1,000 workers, but 125 were laid off soon after. Then, after producing a faulty battery it supplied to Fisker Automotive Inc., A123 was forced to launch an expensive recall. Fisker itself received a $528.7 million loan from the Energy Department to produce high-end electric cars. The company, however, has had successive rounds of layoffs, spurring the DOE cut off part of the loan. Fisker sold no cars in 2011 and only 5000 in 2012, though the White House had predicted the company to sell 6,000 in those two years. In the first presidential debate on Oct. 3, Romney specifically called out Mr. Obama for supporting failing companies like Fisker. "You put $90 billion... into solar and wind, to Solyndra and Fisker and Tester and Ener1," Romney said. "I mean, I had a friend who said you don't just pick the winners and losers, you pick the losers, all right? So this -- this is not -- this is not the kind of policy you want to have if you want to get America energy secure." The Obama campaign today pointed out that A123's assets will be acquired by Johnson Controls, meaning American workers could keep their jobs. "Our interest in A123 Systems is consistent with our long-term growth strategies and overall commitment to the development of the advanced battery industry," Alex Molinaroli, president of Johnson Controls, said in A123's press release today announcing the bankruptcy. Furthermore, the Obama campaign noted that the stimulus has created green energy jobs nationwide. Campaign spokesman Adam Fetcher specifically cited the jobs created in two swing states Romney risks losing by running against the wind production tax credit. "We've made investments that have helped to more than double renewable energy production from wind and solar under President Obama, creating good-paying jobs and bringing manufacturing back to our shores, including investments that are boosting domestic manufacturing of advanced batteries that would help families save money at the pump," Fetcher said. "And unlike Romney, the president supports the wind production tax credit, which supports thousands of jobs in states like Iowa and Colorado." Wind and solar energy production did double between 2008 and 2011. Furthermore, the administration notes that investments in advanced battery and vehicle technology have helped build or retool 45 manufacturing plants in 20 states while bringing down the price of advanced batteries and thus stimulating the market for hybrids and electric cars. Romney, by contrast, would focus government investments in basic research rather than clean energy industries. "Despite the bipartisan support for a clean energy economy, Romney would give up on this progress, abandon the President's goal of out-innovating the rest of the world and cede those jobs to countries like China and Germany," Fetcher said. While investments in green technology have created jobs, the administration has fallen far short of its goals. In January 2011, Mr. Obama promised to have a million electric vehicles on the road by 2015, focusing on 11 models of electric vehicles to meet that goal. CBS News reported in June that six of those 11 models either hadn't made their first delivery, stopped production, or were already out of business. Others weren't even close to the government's 2015 projections. Meanwhile, A123's bankruptcy is just the latest bad business news from a taxpayer-supported green energy company. Tesla recently cut its revenue forecasts due to slow sales, while workers at the LG Chem electric car battery factory in Holland Township, Mich., have been put on furlough before even a single battery has been produced. In addition to A123, the battery company Ener1 filed for bankruptcy this year, while energy-storage company Beacon Power and solar power company Solyndra filed for bankruptcy last year.